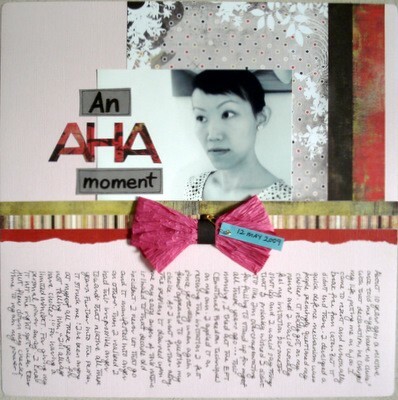 This scrapbooking idea is to capture your last aha moment that you’ve experienced. What was it like when you had an aha moment? Did you really shout “Aha!” or did you softly utter “Ah… now I finally got it!”. Whichever way your exclamation went, such a moment usually opened up a fresh realization or idea you’ve not previously thought of. Let such a moment live in your scrapbook album long after you’ve forgotten about the incident. For me, I had an aha moment yesterday and so this is a scrapbook idea I want to share with you this week. I learned how to use Emotional Freedom Technique (EFT) sometime last week and yesterday I decided to try it out a minor irritation I was feeling. As I tapped, it slowly began to dawn upon me that my minor irritation was linked to a deeper issue, back to something that happened a decade ago! I was surprised to realize the suppressed anger I’ve been feeling towards a particular person throughout these years. As I proceeded further into my tapping session, it eventually struck me that I was more angry at myself than I was angry at that person. I was angry that I was giving away my personal power from that one incident 10 years ago, and it bothered me till now! I knew I hit the right spot when sad tears just rolled down my cheeks… That’s an aha moment for me. And it’s important for me to record it down. So why not go spend some time to reflect on your aha moments and pick one to scrapbook about? It’s going serve as a meaningful reminder in later years. Enjoy! Supplies used: Cardstocks – Bazzill Basics; Blue and gray papers – Grant Archival “Scrapbook Paper Pack”; Patterned papers – Basic Grey “Scarlet’s Letter Collection”; Gold safety pin – from stash; Hot pink crepe paper – from stash; Black marker – Zig Memory System “Dotta-riffic”; Black pens – Uni-ball Signo UMN-207, Zig Memory System “Millennium”, Uni Pin Fine Line.